Tree on slice side of fifth fairway. Yes, those leaves are red. This photograph was taken last weekend. 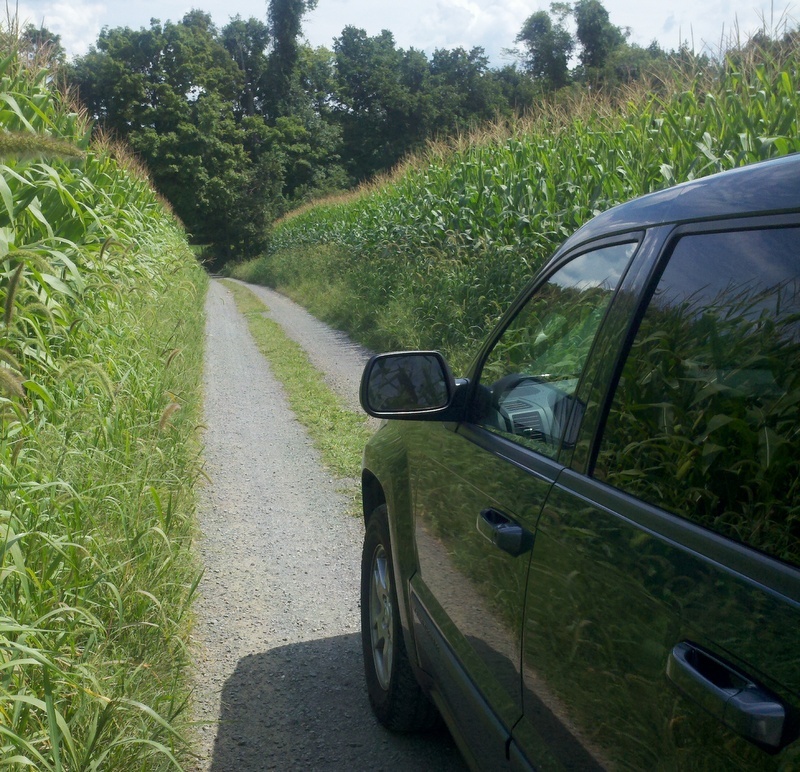 The driveway that leads to my club’s practice range bisects a cornfield. When the range opens for the year, on April 1, the field is muddy and covered with stubble, and as I cross it I know that months and months of golf stretch out ahead. But I also know, in the back of my mind, that the season is already expiring. Our golf year usually ends just before or after Thanksgiving, depending on the snow, and the cornfield is like a living clock, ticking away what’s left. By Memorial Day, there are neat rows of green corn shoots—still eons of golf to go. On the Fourth of July, the stalks are almost as tall as the door handles on my car, and I wonder what happened to June. 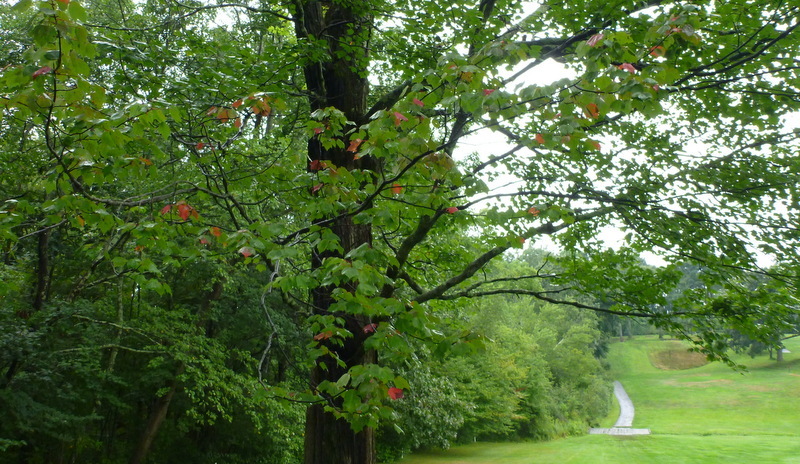 In August, the leaves brush my windows as I pass, and, if someone is leaving when I arrive, one of us has to back up. Then, one autumn afternoon, I decide to try to de-shank myself at the range, and on the way in I notice, with alarm, that the cornfield is stubble again, and that the maples at the edges are more orange and red than green. Some of the year’s best golf weather is still to come, along with more opportunities to wear my Royal Portrush sweater, but now there’s no denying that golf is almost done. Car driving to range last Wednesday. Photo by Hacker (real name). There are clocks all over our course. Every spring, I forget about the fruit trees until they blossom. Then the blossoms fall, and it’s like pressing the snooze button: I don’t think of them again until crabapples and chokecherries have covered the ground near the eighth and ninth tees. Hitting crabs with pitching wedges is fun, but it’s also a reminder that time is growing short. The big oak that overhangs the clubhouse begins to drop ripe acorns in late July. They sound like golf balls when they hit the roof, and some of them bounce onto the putting green. By September, the turkey chicks that wander in and out of the woods at the bottom of the range are getting hard to tell from the hens. Then the leaf blowers begin again: maybe ten Sundays to go. Not long from now, we will have our first serious snowfall, and that other clock will begin to tick, the one that measures the empty weeks until spring. It will move as slowly as the clock on a classroom wall, but it will move. And when it starts I will know that in just four months, give or take a week, the range will open again. So nice to live where i can play golf all year round, New Zealand, Paraparaumu Beach Golf Links. What about hitting balls on the beach at crabs? Fun stuff. Wow. How sad! October/November in So Cal is just about when we start wondering when we have to put slacks on. Or, head out to Palm Springs where it’s still 80+. David, these are the same emotions I have living in Missouri. But isn’t crisp autumn golf fantastic! Autumn golf is definitely the best–and not only because an astonishing number of members of my club stop playing after Labor Day. Fall golf IS awesome!. Even better when you can enjoy it in the Deep South! It also is a sign of college football – can you spell SEC Football? You don’t have to put your clubs away down here – we keep ’em in action year round! I’ll take a driver, wedge and 2 putts over a snow shovel anytime! That is why God invented airplanes; if you want to see snow, you can fly over it and peak out the window. Have enjoyed the great weather of the Deep South virtually all my life. You can keep the blizzards and snow storms, I will take a little heat and rainy season now and then. But “no thanks” to sub 70 weather! Steve J. I’m looking forward to seeing some SEC teams travel to Mizzou this fall. I live in St. Louis but have a really good friend who lives in Columbia, so I’ll let him twist my arm and travel there a few early Saturday mornings, play 18 -27 holes and then catch a football game. Not many better ways to spend a Saturday!